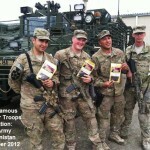 Every few months, Jeff’s Famous Jerky proudly donates a huge box of jerky to our US Troops. 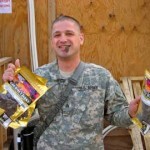 In addition, many customers also participate by sending our jerky to troops who bravely serve our nation. 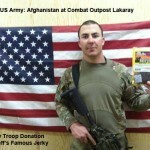 Jerky is one of the most requested items that soldiers want while away from home overseas. We maintain lists of American troops and those who distribute to American soldiers. 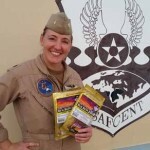 Although we already do some of our own direct donations… we sure appreciate your help in providing even more jerky to the many men and women who risk their lives in the military everyday. 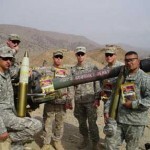 Soldiers often want an email or mailing address of the person who sent them jerky. Include this information in your personal note if you wish. “A few weeks ago I ordered an 8-pack variety pack. I sent you a message attached to the order letting you know that I would be sending the jerky to a soldier in Afghanistan; I mentioned that I was informing you of this only because I could tell from your website that our American soldiers are important to you. When I received my order, you had included two extra packs and a nice hand-written note! I included the note in my care package to the soldier, with a narrative of what a nice thing you had done. Jeff’s Famous Jerky was a major sponsor of this event. 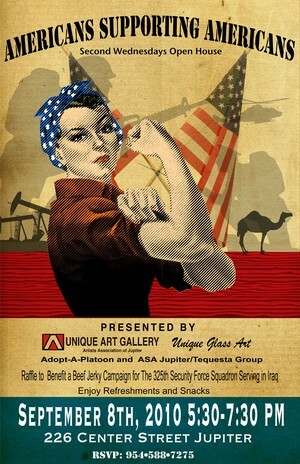 We donated more than $250 worth of our gourmet jerky to kick off this event and to be sent directly to troops overseas. In addition our jerky was there being sampled and sold to raise money to send even more jerky to troops overseas. The event was a huge success! Most orders ship the same or next business day. Orders to troops via APO addresses generally take about 2 weeks to arrive. Allow the military a little extra time during the busy holidays. Are you or a loved one currently serving our county in the military? Use the form below to send us a request to add you to our distribution database.